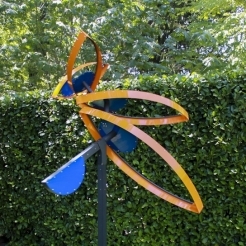 John Berggruen Gallery is pleased to present an exhibition of new kinetic sculpture by American artist Pedro S. de Movellán. This exhibition marks the artist’s first solo exhibition at the gallery, as well as his first exhibition in San Francisco, and will be on view November 21 – December 28th, 2013. The exhibition will coincide with the publishing of de Movellán’s catalogue raisonné “Pedro S. de Movellán: Complete Works 1990-2012,” written by Maxwell Davidson IV and Charles C. Davidson, and published by Schiffer Publishing Ltd. John Berggruen Gallery will host an opening reception for the artist on Thursday, November 21st from 5:30 – 7:30 pm. 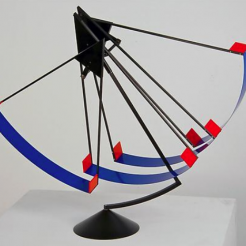 Pedro S. de Movellán is considered one of the world's most well known kinetic sculptors alive today. The son of an abstract painter and an architect, de Movellán perfectly balances both of their influences in his own work, along with the influence of modern masters Alexander Calder and George Rickey. Each work is unique, precisely constructed to be refined and detailed, yet unpredictable in its motion. His sculptures invite both a playful curiosity and an educated investigation into the physics of his careening constructions. These works evoke both the spontaneity of their external influences (they are susceptible to react to even the slightest breath of the viewer) as well as inspire a careful examination of their elaborate mechanical qualities. de Movellán transcends the role of the expressive artist to incorporate the rigorous training of the engineer and the obsessive conditions of the innovator into his multidimensional works. The sculptures in this exhibition aim to describe their surrounding space, to elaborate on the potential of the design of the room it belongs to. In short, de Movellán’s works not only contribute towards an elevated sense of their immediate space, but also, define it. These kinetic sculptures are not designed to revolve or work around other aural elements; they instead use a privileged centrifugal energy to transform and advance their environments. de Movellán has a Bachelor of Fine Arts degree in sculpture from the University of Massachusetts at Amherst. His work is in private and corporate collections in the United States, as well as Switzerland, Germany, and Saudi Arabia. De Movellán’s work has been exhibited in solo and group shows at the Herter Gallery, University of Massachusetts at Amherst, and the Grinnell College Art Gallery, Bucksbaum Center for the Arts. He lives and works in Stockbridge, MA.